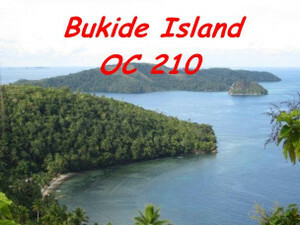 I has QRT from Bandaneira Island OC-157. In bad propagtion I just got 1.165 QSOs. 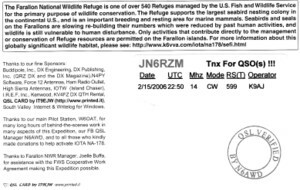 Look in Clublog for my detail QSOs statistic and also OQRS. 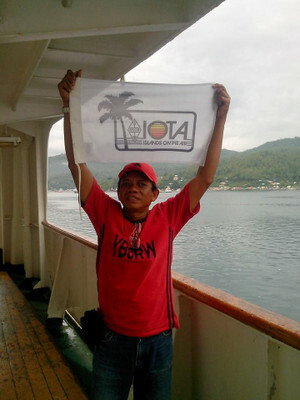 Now I am waiting in the Bandaneira sea port for my next trip to Ambon and than continue to Yamdena island OC-224 by airplane on Dec 29, 2014. CU on the Band and let we play CW Dancing again. 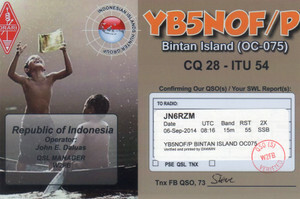 In the bad propagtion, I just got only 551 QSOs. 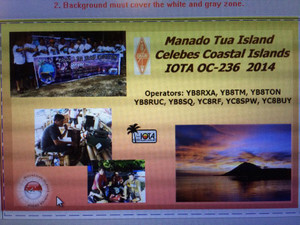 Please looking in Clublog for my detail QSOs (yb8rw/p_OC-157) I am QRT from Banda Naira Island OC-157 15.00z 27Dec' 2014.
and also for the QSO with me at OC-070 Ambon Island can be seen in the Club Log YB8RW/P_OC-070, also OQRS. 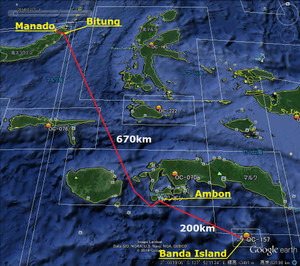 Yamdena Island OC-224 on December 28-31, 2014. 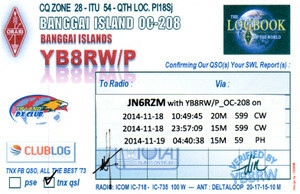 Bernhard DL2GAC will again be active from the Solomon islands as H44MS between February 1 to April 30, 2015. 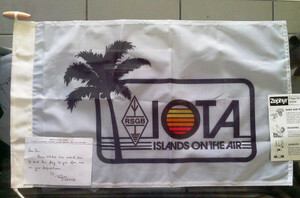 QRV on 80m to 6m SSB only. 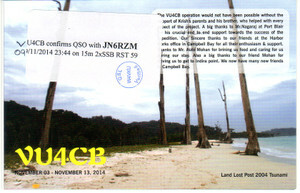 QSL via bureau or direct to H/c. 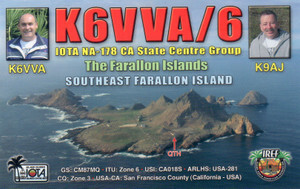 During the week of December 15th 2014 we plan to operate SSB on the HF, 6m, 2m bands from SE Farallon Island. 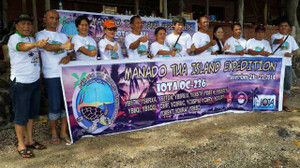 Grid CM87LQ, IOTA NA-178. 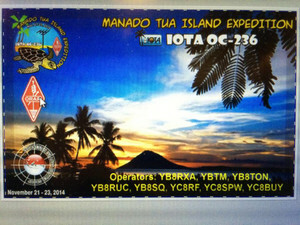 Currently Iwan YC8UTI is very active in 15m band CW mode. 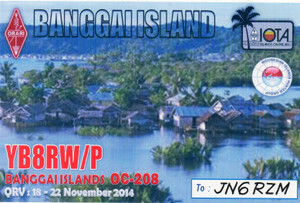 He is QRV from his home base station in Karakelong Island OC-209. 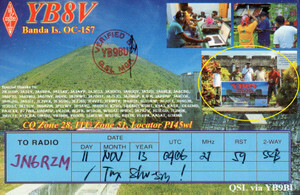 QSL ok via YB3MM or direct to himself. 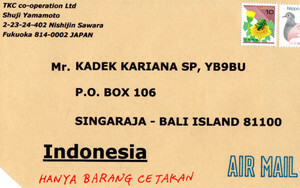 He asked everyone who request by OQRS, to also send your paper QSL via buro. YB8XM Joppy re-printed OC-070 YB8XM/P Seram & Saparua Island QSL card. 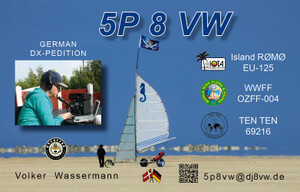 He is already starting to send those QSL cards. 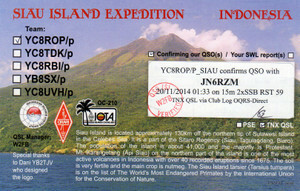 get Seram Island QSL card via OQRS. 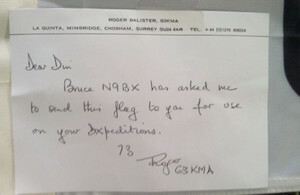 I proposed he upload to ClubLog but he doesn't entry Seram QSO data in. 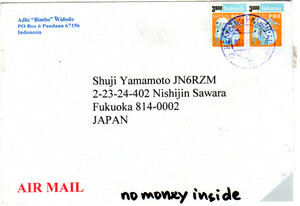 If you want it, please send him 2USD & QSO data thru PayPal. 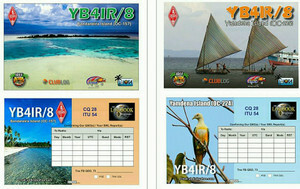 and past QSL cards by YB9BU. Thank you for your note. 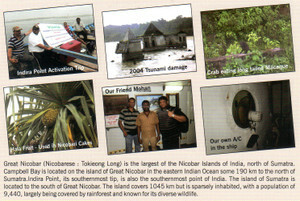 The information on the two expedition websites is the latest regarding QSLing. I am still waiting for the QSL cards to arrive from Sicily. They have been shipped to me more than 3 weeks ago, so I hope to receive them any day. 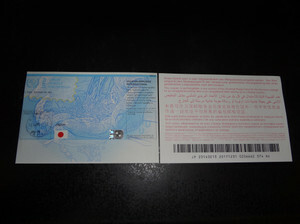 I will most certainly update the website information in due course. 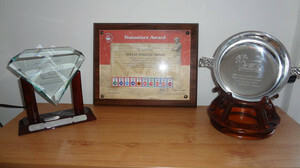 Once again, thank you very much for your very generous support of these two projects. Been listening since 1000Z, 3 hours, not a peep from OC-150 on 40 or 20 meters. Maybe they do not understand propagation or poor antenna? 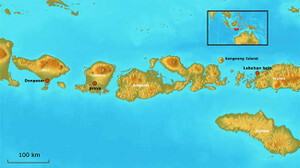 Seems North America will have to wait for another operation from this island. Thank you for trying Shu-san. Same here. All spots on them are for 15m. 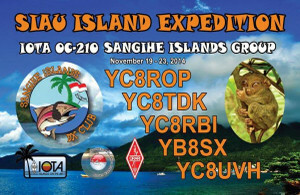 December 10-12 starting at around 0900Z a team from Bima will be activating Sangeang Island OC-150. 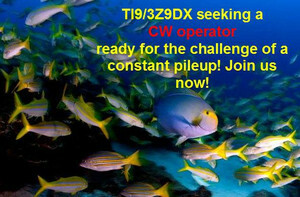 The operators will include YC9WGR, YB9IPY, YC9HF, YC9GBO, YC9JAJ, YC9JYB, YC9GGF, YC9IPH. They most likely will sign homecall/P. 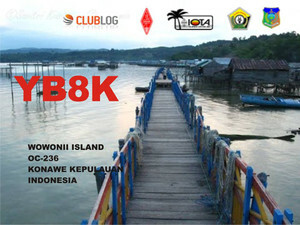 QSL direct to homecalls. 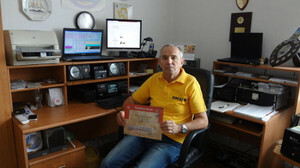 SSB Mode only on 40,20,15,10M. 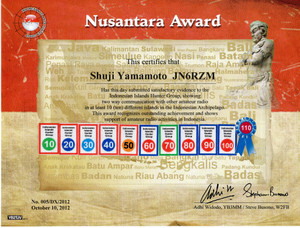 This is a new counter for Nusantara Award. 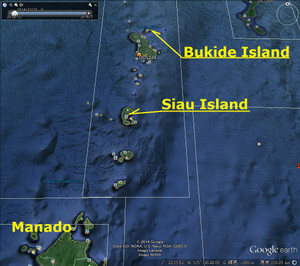 Good luck to all YB Islands Hunters. 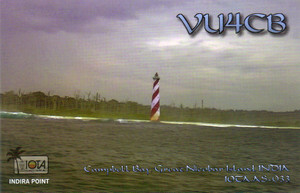 Thanks to YC9GWR and YC0OST for info. I`m with ORARI Club Station Bima YC9ZGG (ORARI Lokal Bima, West Nusa Tenggara) will going to QRV in Sangeang Island OC-150 (near Mt. 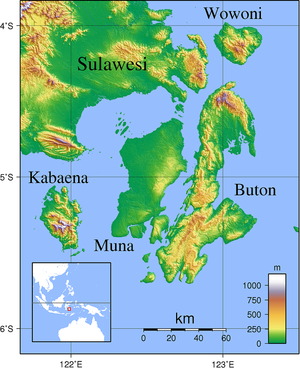 Sangeang, one or two hours drive away from Bima City, West Nusa Tenggara, Indonesia) starting from December 10 - 12, 2014 around 5.00 PM local time (0900 UTC) with several local Amateur Radio Operators : YB9IPY, YC9HF, YC9GBO, YC9JAJ, YC9JYB, YC9GGF, YC9IPH. 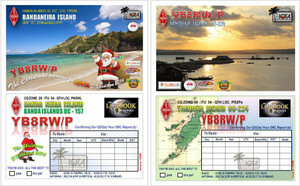 We will working on HF Bands SSB Phone Mode 40,20,15,10M Bands and QSL: home call Direct. Equipment : Radio Transceivers, Homebrew Antennas 3el yagi 15M, Qubical Quad 10M, Delta Loop 40M, Dipole 20M. 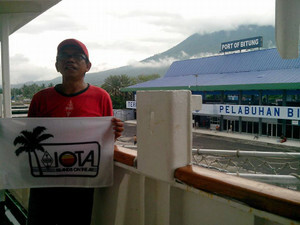 Good luck for IOTA hunters ! 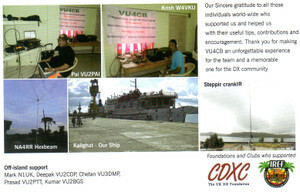 For more QSL info, please read carefully my QSL - ing information. c/o Hokky Mart, Jl. Sulawesi no. 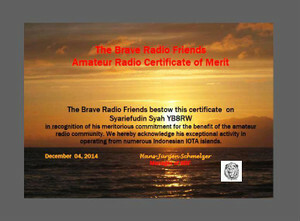 3 Bima (84113) - Nusa Tenggara Barat, INDONESIA "
This certificate is meant to be a humble expression of gratitude towards you for your activities for the benefit of the amateur radio community. 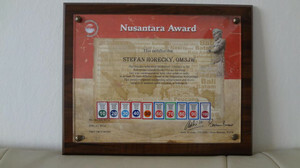 we sending you the "Certificate of Merit" and the membership certificate for free life-long honorary membership in our international DX club in the attachment. Steve Busono Hi Shu. 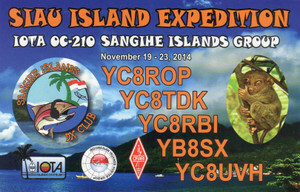 I will open OQRS for YC8ROP and YC8UVH later this week. 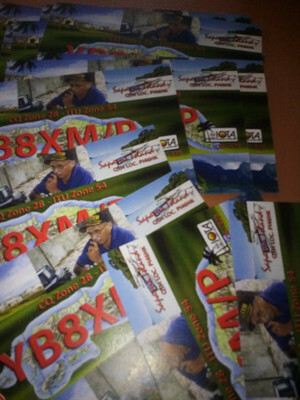 QSL cards arrived from printer. Claimed by: 55.1% of participants.